I made a little more progress on the shay. I have it all wired and took it for a test drive. The engine ran really good...when it made electrical contact. It seems that the rear truck is not making contact all the time and only the front is working good. I will have to do some poking around with the rear truck to find out where the contact trouble is. I soldered wires onto the truck bolster to get the power from the truck to the decoder but I may be having an issue with the power going from the side frame to the bolster, which I can solve by just soldering the wire to the side frame. The front truck is working good because I made pickup wipers that get power from the tread of the wheels and from the backs, so each wheel has two locations that it makes electrical contact, and the wipers pivot with the side frames so they stay with the wheels when the truck rocks forward and backwards. The rear is a different situation because the truck can rock forward / backwards and side to side, so the electrical pick there is only on the treads on the insulated side and by the side frames on the non insulated side. I will keep working on it. I am still not happy that the wheels are steel and not nickel plated, I can see that is going to cause lots of issues with surface rust if I don't keep up on it. Here is the shay all wired up. The large black box in the firebox is the main speaker cabinet, and the plug sticking up near it is the plug that goes to the speaker mounted in the smoke stack. 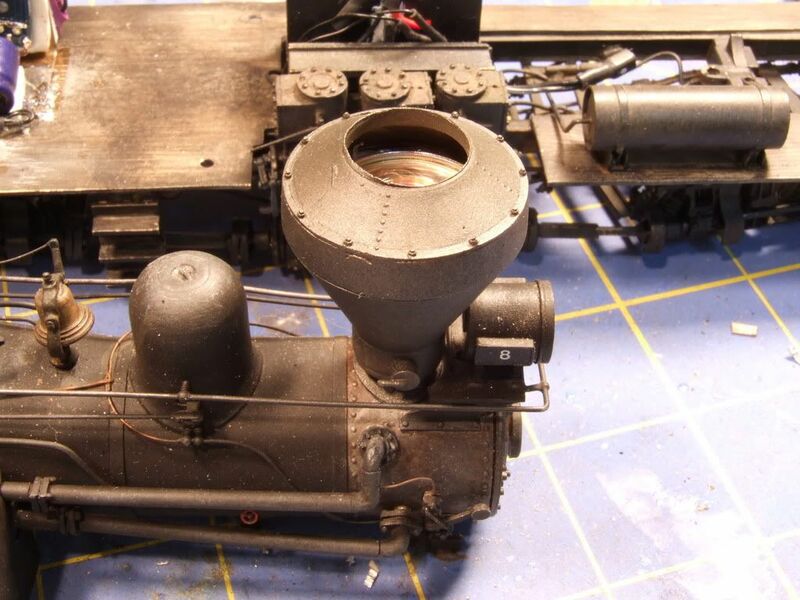 There is another plug that comes out of the front of the firebox that supplies power to the front head light. I made some single pin plugs for the front truck, they hard to see in the photo because they are painted the same color black as the underframe but one can be see just in front of the firebox behind the frame rail. In the tender area is the Faulhauber motor, mounted vertical, which pivots on a post in the bolster using a Precision Scale motor cup. The motor has a dog bone like piece pushed onto the shaft, which goes into a special bevel gear that has a universal cup molded to it. 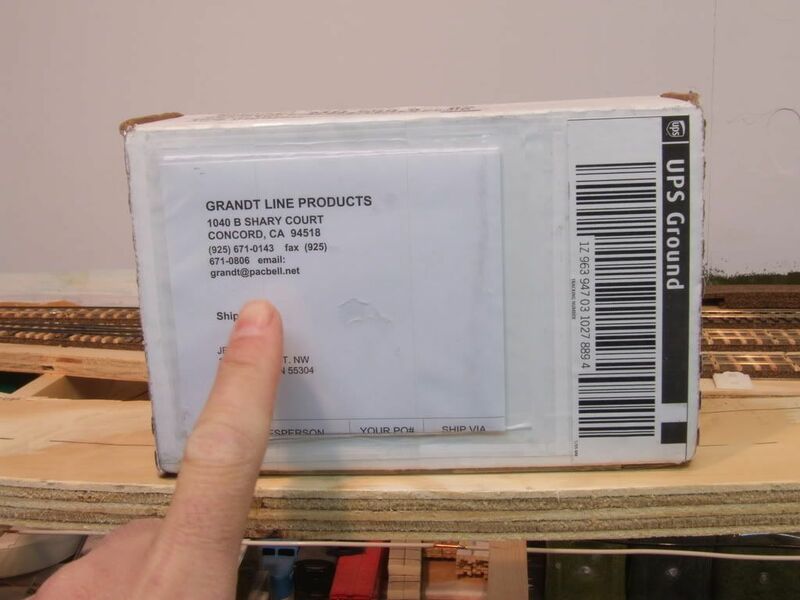 There is a piece called a cross box mounted on the rear axle (a Grandt Line part I got from Coronado). The Soundtraxx decoder is mounted to a piece of brass. The small vertical brass tab next to the motor helps keep the tender wires inside the open area under the tender shell, it makes putting on the shell easier. The plug in front of the motor is for the cab light and the backup light. All those plugs allow me to remove the shell without any wires still connecting, and every plug is different so they can't be connected wrong, just like the auto makers do. Here is the 3/4" diameter speaker that is mounted in the stack. I made an outer ring out of styrene to mount the speaker in. The speaker is held in with hot glue that I apply with a tooth pick and work it around, I use a small solder iron to work the glue more if needed. I will place a black painted screen in the top of the stack so the speaker is hidden. Did the extra speaker make a difference....maybe? The large speaker in the firebox is pretty loud compared to the one in the stack, but I do notice a fuller range of sound, however I don't think I would try doing it again, a lot of work for little gained. Here us with top of the stack on. The stack is a friction fit and stays on good. This photo shows the top deck of the tender. 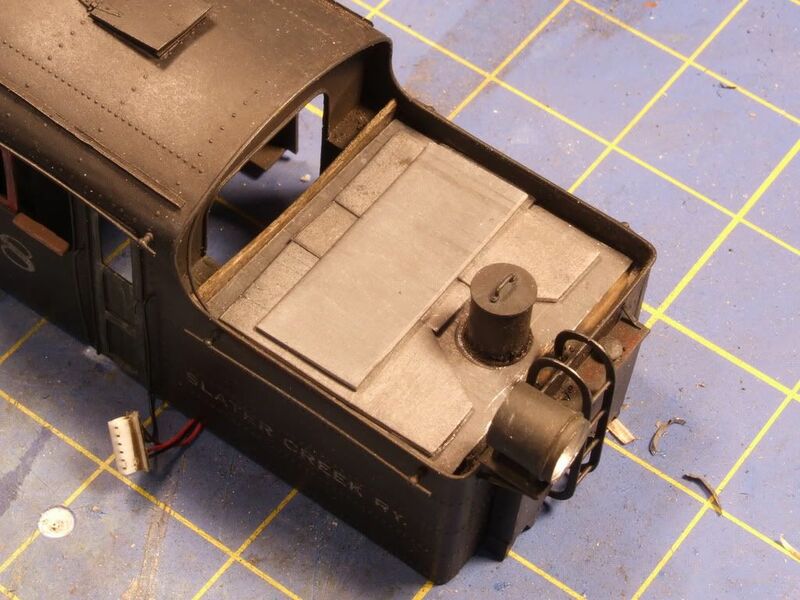 I had a nice load of coal (with detail) all glued in place, but after I mounted the Faulhauber motor I thought there was not enough clearance, so I dug out the load and cut the top of the tender area open, which then I could see clearly that there was not an issue. I took advantage of having to put on a new tender deck by cutting lead sheet to build a new top and stack up to form the coal pile. 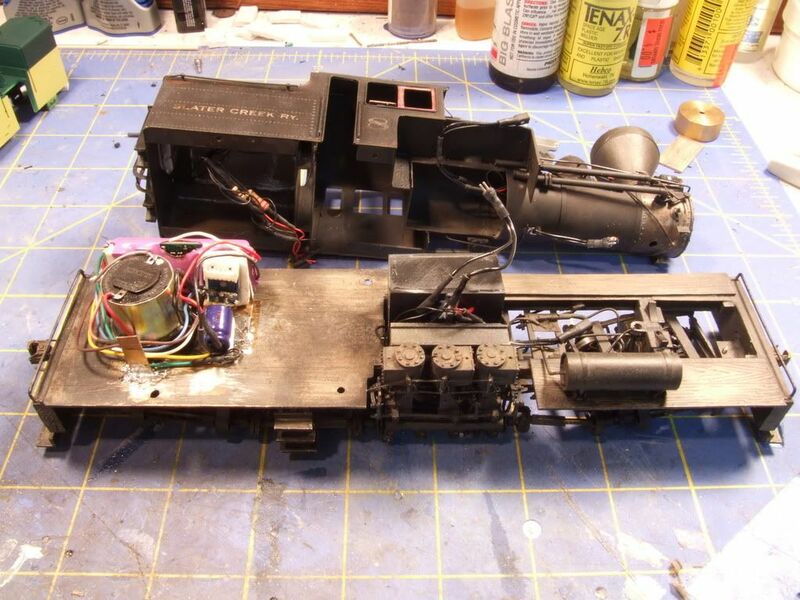 This new tender deck added some much needed weight to the rear of the locomotive, which was front heavy due to a large weight in the boiler and the tender being a pile of wires. After I get the electrical pick-up issue resolved I will finish the cab off with windows and figures. I have to put off the interior details until I get more done on the layout. She is looking more and more magnificent, and I hope you will take video of her running so we can see that motor in action I am very curous about that. I am sure it will be a pretty sight. I know if it's entered into a contest, it will win! In regard to the wheels not being nickel-plated, there are kits where you can do the nickel-plating yourself, or services that will do it for you with a quick turnaround (you only need to mail it to them). Very tidy installation. The motor installation looks great. Always amazed at your metalworking skills. The thought of dealing with electrical pickup and internal wiring issues keeps a lot of my projects on the shelf. Jeff, some nice upgrades. I can just see me trying to do that in an HOn3 Shay. I was just reading a thread by Greg Rich over in the Early Rail Forum. 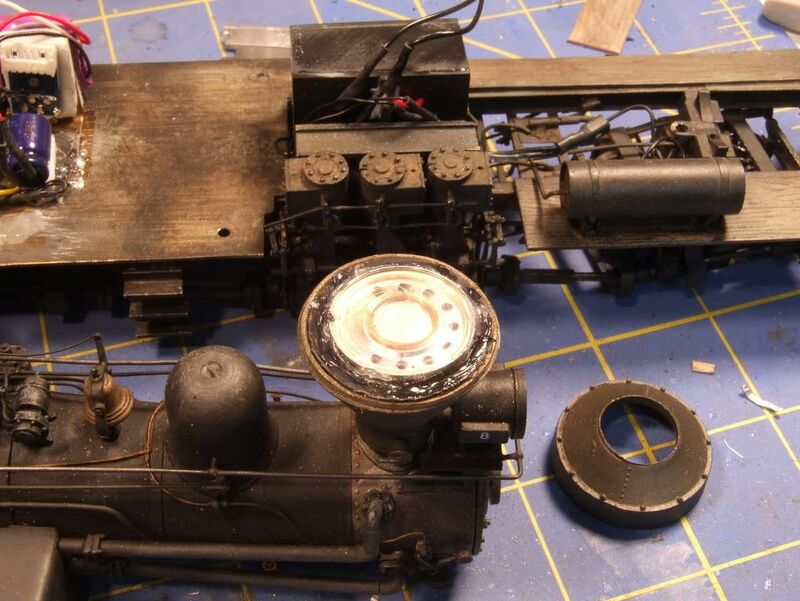 He is repowering an HO Ken Kidder 2-6-0, and used a great technique for electrical pick-ups. He describes it in his thread. It might be of help on this project or future ones. Thanks for posting that link, I have seen that method somewhere else and forgot about it. I will have to think if that would be possible on a shay truck. I think my biggest issue is the steel wheels. I am going to try and polish them and see if that helps. I got the shay running pretty good and took it for its first test run. I still have some adjusting to do on the gears, they are a little out of mesh, I need to get the pinion gear closer to the ring gear because going forward it skips a tooth every now and then when it is under load. I am more than a little unhappy with the head lights. I got some golden glow LEDs because I wanted to build them into the light castings and not worry about them burining out. I have used them before and thought they looked good but the ones in this locomotive are way too bright and in the video look almost green. I think I will try a different resistor and see if I can get them a little dimmer. I built a special test that used 8 pieces of rail, one for each wheel. I soldered contacts to each piece of rail and used test leads to see which wheel was not making contact, I found two wheels that were not making good contact. After checking the wipers, which were working fine, I decided to just give the wheels a really good cleaning. I first used metal polish and cleaned every wheel, then I cleaned off the polish. I decided to record the first run and post it to Youtube, so your seeing exactly what I saw. The video of it backing to hopper cars was the first time it coupled to a string of cars. I love how slow the Shay moves! Before you think about replacing the LED headlights, you may want to consider Tamiya paint. Les Davis spoke of a few brands of Tamiya paint that he has used to change the color of some of the headlights on his locos. I've read that Testor's Insignia Yellow or Tamiya X-24 Clear Yellow does the trick. Just a thin film does the trick. The LED headlight on my Mogul was too bright and too blue so I toned it down with a coat of dullcoat and light yellow. Just my thoughts- I am sure you'll have the solution in hand by now. Yeah I am here, the Tamiya paint is really good that coloring the lights. You can do a single coat to change the color and more coats will change it even better. Last year I did 2 ON3 brass shays for a friend, If I didn't know better the same person did the installs. I did LEDs for the front and rear lights, and a smoke box light too. I also had a edge ported speaker...installed previously from a PFM install. Took abit to get running, cleaning wheels and lubing went along way. I didnt swap out the speaker, in hind sight I would have done it just because of the better speakers today. Interesting to see a speaker installed in the stack..
Wow, that looks and runs great! Sounds good too, and the hoppers are really nice. I also taped the walls of my engine house together to see how it will fit the space. Boy are O scale structures big. 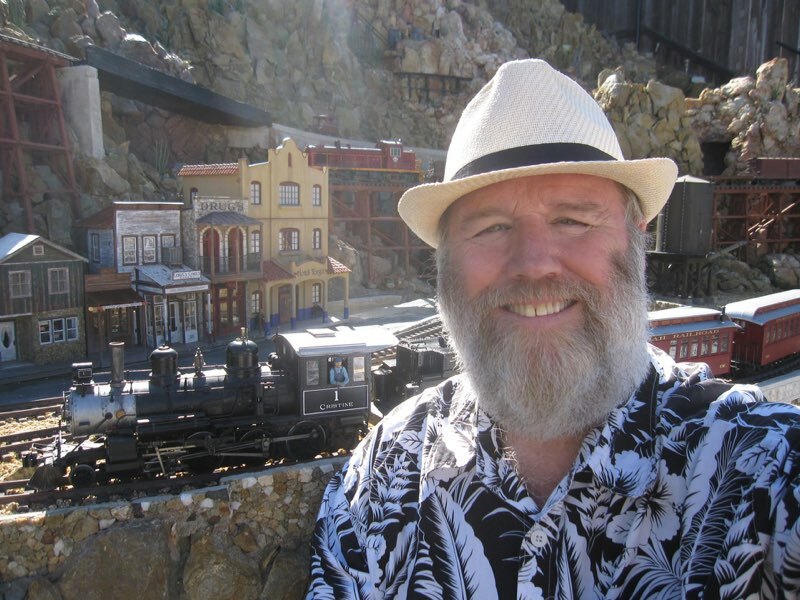 the scenery you see behind the train is not on this layout, it is a piece from my old HO layout that I set on the layout to judge the colors of the backdrop I am painting. and I started to build the grade up to the next town. 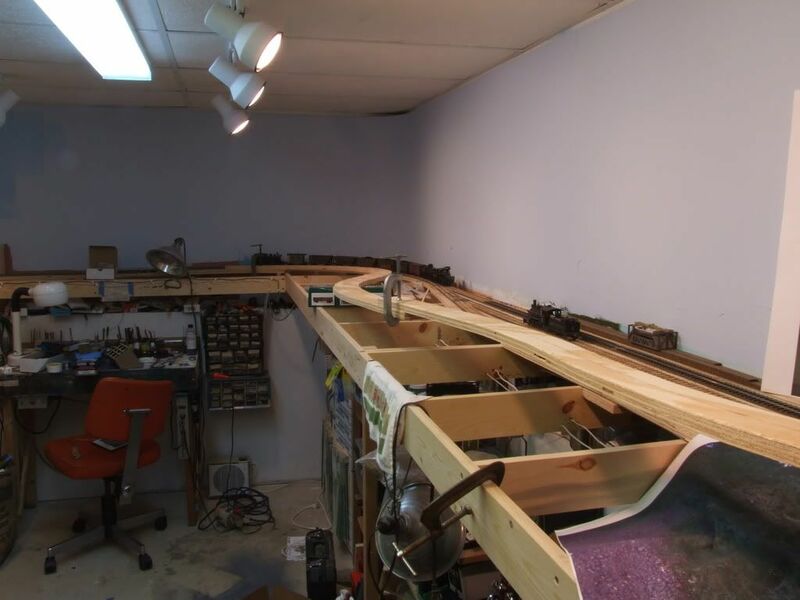 so far I just got the roadbed cut and mocked up so I can see how the grade will work out. I purchased and installed 5 "the Hare" turnout decoders. They are tricky to program on Digitrax but easy to install and they are loaded with nice features. Nice progress Jeff, but 9 months foe delivery..that's a pain in the *** I get impatient when it takes more than 2 weeks..
Jeff, I don't remember if I ever spoke up before, but outstanding layout and exceptional work. I've been following your progress from the beginning and am thoroughly impressed. Always looking forward to seeing more! Looking good. O scale structures big? Remember that the engine house kit is SMALLER than the real thing! The shay looks fantastic. Good luck on the engine house. I just finished a plaster kit and it was a nice change of pace. Great to see some progress pictures! Can't wait to see what you do with the EH. Also, IMO that scenery piece may be in HO scale but does not look out of place at all- maybe you could recycle quite a bit from your HO scale layout?